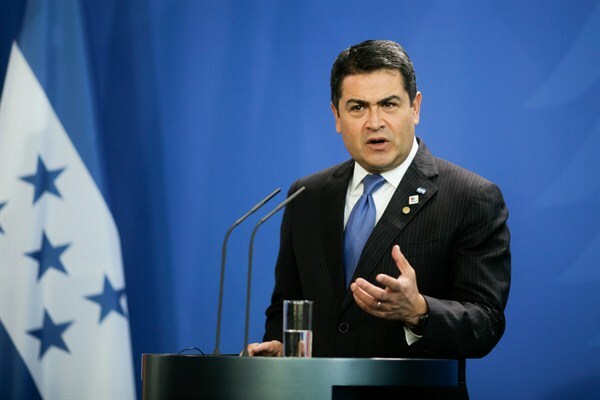 Honduran President Juan Orlando Hernandez at a news conference in Berlin, Germany, Oct. 27, 2015 (AP photo by Markus Schreiber). After months of anti-corruption protests, Honduran President Juan Orlando Hernandez recently announced an agreement with the Organization of American States (OAS) to create an anti-graft body, the Mission to Support the Fight Against Corruption and Impunity in Honduras, known as the MACCIH. A similar, U.N.-led initiative next door in Guatemala, the International Commission Against Impunity in Guatemala (CICIG), strengthened the rule of law, helped to root out corruption and brought down Guatemalan President Otto Perez Molina. Yet despite those relative successes, observers should temper their expectations that the MACCIH will have any meaningful impact on corruption and impunity in Honduras.